The Interest Poster Set provides powerful visuals to demonstrate how interest can be your best friend or worst enemy. 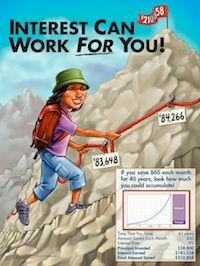 These large, colorful 18” X 24” posters can be in courses such as economics, personal finance, consumer economics, math, and business economics. The Interest Can Work For You poster shows students how interest – with regular saving and investing – can help them earn a sizable amount of money for retirement. 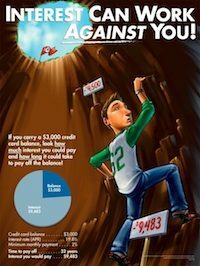 The Interest Can Work Against You poster shows the opposite – how excessive, high-interest debt, such as credit card debt, can be a huge financial burden. Click on a poster image below to view an explanation of the concept, teaching ideas, and suggestions for a Literature Connection. Download the free Teacher's Guide which contains a lesson on each poster.